Historic house, known as `The Rose in the Bouquet of Turnovo`, built in 1871 and designed by one of Bulgaria`s best and most well known architects, `Maister` Kolio Ficheto. 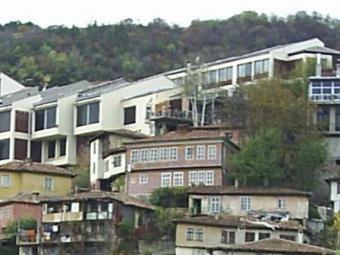 Built on three levels, south facing and clinging to the rock cliff that all of old Turnovo is built on, the house is 220 sq. m in total, with a small courtyard garden of 230 sq. m.
All services are connected, including electricity, water, mains drainage, telephone and cable television. Ficheto`s designs were unique and very distinctive and this house is typical, with its painted bricks and relieved pointing, tiled roofs and wooden floors throughout. Third level (100 sq. m): dining room, kitchen, living room, bathroom / toilet, two bedrooms. Outside, there is a small but well stocked garden, with walnut, cherry, loganberry, fig, apple, pear and pine. There is also an ancient vine, shading the patio in the summer. The view from the house is just spectacular, with unique panorama, to the Four Kings Monument, Stambolov`s Bridge, the River Yantra, and Bulgaria`s first parliament building in the modern time, also designed by Kolio Ficheto. With the small courtyard garden being easily accessible from one of Turnovo`s winding streets that invite exploration, this architectural monument is perfect to develop a small business.